With doors opening at the end of this month the world’s largest boat show Fort Lauderdale is set to make its 50th show anniversary its best ever! Prepare to be Dazzled by the Billion-Dollar Golden Anniversary Showcase of the Grande Dames of Yachting, When it comes to superyachts, size does matter. Read “The Golden Anniversary Queen” story for more on Trident. the owners and twelve royal guests in seven luxurious suites. Don’t feel like taking the stairs? Use the elevator to travel up through the entire yacht to the sun deck inside, in a virtually seamless solid block of marble. Location: Hilton Fort Lauderdale Marina. Subtly sophisticated. Big City boasts a subtle, sophisticated interior, complemented by a distinctive dark blue hull. Designed by Patrick Knowles, her interior is exquisitely appointed with textured fabrics that add depth and distinction to the soft, calming décor featured throughout. She captures the nuances of both contemporary styling and traditional sensibilities. 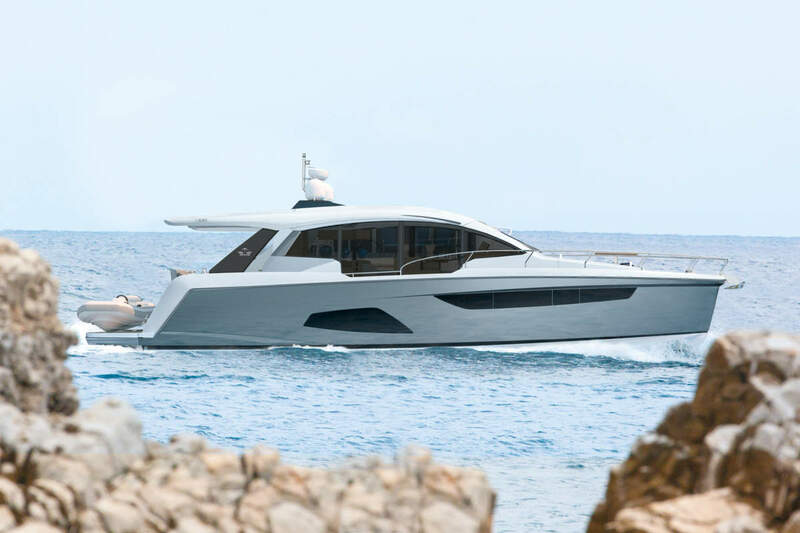 Most notable amongst her incredible features are the Portuguese bridge seating area located forward of the pilothouse and the 18′ x 28′ swim platform, a Trinity trademark, that is large enough to enjoy sunbathing or even dining, at sea level. Nothing has gone unnoticed on this sophisticated lady, from the top deck hot tub to the custom designed staterooms and luxuriously comfortable salon. Prêt a porter. Style, elegance and class are the words du jour when it comes to the newest launch from San Lorenzo. The 92-ft. SD92 is like the chicest loft in New York or the finest penthouse in Paris, with hardwood floors, modern fine art, a deluxe owners’ suite, VIP guest suite and three more luxuriously tasteful guest cabins. She is decked out in sleek leather, crystal and metal, with furniture by Joseph Hoffmann, the Austrian architect who is considered by some to be the founder of modern design. We hope you enjoy the 50th Fort Lauderdale boat show we certainly will with the impressive line up at this years show.